Various different cell types in the body experience mechanical forces and the effect of cell stretch, compression or other mechanical stimuli has become a new and important scientific focus. Many devices have been developed to stretch cells. Usually the cells are cultivated on elastic membranes and the entire membrane is deformed to deform the attached cells. This approach has been proven useful but suffers one big disadvantage: If cells are to be imaged during or after the membrane is deformed, the cells are displaced relative to the optical axis of the microscope and a microscopic observation becomes virtually impossible. As shown in the figure below only the part in the center portion (red X) remains stable relative to the objective of the microscope. Our dcCS10-compensation is moving the entire membrane during the stretch so that it counteracts this displacement. As a result the region of interest is still precisely positioned above the objective of the microscope during (and after) the stretch. The benefit: Cells can be imaged even during stretch! When cells are grown on an elastic membrane and strain is applied to the membrane, only the center portion of the membrane can be used for imaging because only this part remains at its initial position relative to the objective of the microscope. This is a serious disadvantage as only those cells are available for microscopical investigation that have grow in this center portion of the membrane. We developed a computer-controlled stretch device that overcomes this impediment by using active motion compensation. With our new stretcher cells can either be subject to uni-axial strain or strain relaxation (compression) and it allows to simultaneously image the cells at high optical resolution. This is possible at any position on the membrane while strain or compression is applied. Numerous other features have been implemented to ensure easy handling of cells – during prolonged cell culture in the incubator as well as on the microscope. This compact cell strain device makes it possible to perform life cell imaging studies where a rapid image acquisition is required, such as observing changes of the intracellular Ca 2+ concentration when cells are mechanically stimulated. A big advantage of this cell strain device is its stretching chamber, which allows to use commercially available PDMS sheets. The sheets are transparent and as a consequence it is possibleto perform regular bright field as well as epifluorescence microscopy with an inverted microscope. The commercially available PDMS substrates are thin enough to use even oil immersion objectives. The cell strain device is not operated by the microscope software but the program is running on a separate computer – a small laptop or even a net book with the appropriate interface is sufficient. This enables the scientist to use the stretcher on any microscope and regardless of the image acquisition software installed. Naturally the device can also be used without the microscope. Figure 1 below shows a schematic of the device. The strain/compression device consists of two different components with different functions. One component deforms the membrane, which allows the user to strain a mounted membrane chamber or to compress a prestretched membrane chamber. The other component compensates the undesirable lateral displacement by moving the entire carrier plate (see figure 1A) along the strain/compression axis. The synchronous interplay of these two components keeps any desired region of the membrane at the same position while applying strain or compression. The deformation component is made of two sliding blocks where the membrane chamber is mounted during the experiment. To stretch the membrane the two blocks slide in opposite directions on a linear motion guide thereby changing the length of the membrane chamber and deforming the cells. One sliding block is directly displaced by the SC motor via a ball screw whereas the other sliding block is pulled in the opposite direction by an attached metal band and a pulley mechanism (see also figure 1A). Any movement of the motor driven block leads to a displacement of the other block for the same amount by the pulley mechanism. A spring tethers both sliding blocks to provide a permanent pulling force. This provides the necessary counterforce keeping the metal band under tension. Increasing the distance between the two blocks requires the motors, whereas the passive, attractive force of the spring allows to decrease the distance (see arrows in figure 1A). Figure 1. Schematic of the strain/compression (SC) device. A: The SC-device with the membrane chamber attached is mounted on the microscope. The carrier plate is shown in gray with all attached components in matching colors. The SC motor is mounted on the carrier plate and deforms the mounted membrane chamber by moving the sliding blocks via a ball screw and a metal band (see also text). To compensate the stretch-induced lateral displacement the carrier plate is moved laterally with the ball screw driven by the compensation motor (both in blue). The red arrows show the movements of the membrane holders during deformation and the movement of the carrier plate to compensate the lateral displacement. B: The membrane chamber shapes the elastic membrane into a tray that is used to cultivate the cells. In the view on the top right one of the holders is shown before assembly. Two double hooks of the prestrain holder (bottom) are holding the membrane chamber and can be moved freely along the plate rail and fastened at any position with two screws.b Observation of the membrane chamber with a regular cell culture microscope through the observation window allows inspection of the cells during cultivation of the cells without removing it from the prestrain holder. C: Membrane chamber and prestrain holder are readily assembled. The next steps are usually autoclaving and coating of the membrane followed by seeding the cells into the tray. 1) Any desired strain protocol, including cyclic protocols with different characteristics (linear, sinusoidal, sigmoidal) can be programmed. This includes pauses or loops to insert static phases or to repeat a specific sequence. 2) The position of the membrane chamber along the stretch axis can be changed independently from movements for motion compensation. 3) For mounting the membrane chambers the distance of the two sliding blocks of the SC component can be adjusted. Thus membrane chambers of any length (within the limits of the device) can be mounted which allows to also mount prestrained membranes and to compress cells. The membrane chamber comprises the membrane holders and the transparent membrane (thickness 127 microns). The membrane holders clamp the membrane so that it assumes a flat bottom with two side walls (angle of ca. 60°). So a tray is formed which allows to use the chamber like a regular culture dish. In figure 1B (top right) a side view of the membrane chamber during assembly is shown. One of the two membrane holders is shown before clamping the membrane to illustrate the mounting process. Once the membrane chamber is assembled it is hooked onto the prestrain holder where it typically remains during the entire remaining procedure (autoclaving, surface coating, seeding of the cells). 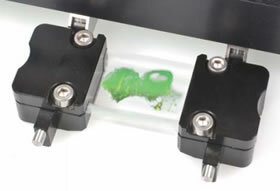 The membrane chamber conveniently fits in a regular 15cm culture dish, which allows sterile handling outside a sterile work bench and even to monitor cell growth in a conventional cell culture microscope with a low magnification objective. Two metal rods in the membrane holders are used for mounting the membrane chamber onto the two sliding blocks of the SC component. The rods and the sliding blocks are designed to easily mount and unmount the membrane holder from the device and to perform all necessary steps without deformation of the membrane which might lead to an unwanted deformation of the cells before the actuall stretch. The two membrane holders can slide along a plate rail (see figure 1B) and can be locked at any desired prestrain with two locking screws. Mounting the membranes with prestrain is not only necessary for a later compression of the cells in the SC device but usually the membrane is mounted with a slight prestrain (ca. 20%) to flatten the bottom of the membrane. Naturally, if cells have to be compressed the prestrain needs to be high enough so that the membrane still remains under tension after relaxation. The upper limit for prestrain (and therefore compression) is ca. 100% and defined by the total strain that can mechanically be applied to a membrane and by the stretch resistance of the membrane. How does the motion compensation work? The motion compensation is not based on a feedback mechanism that recalculates the position from new image data but it is entirely based on the distance of the area of interest from the center of the membrane. To keep the specimen in the field of view of the microscope during stretch or compression of the cells the SC-device simply has to "know" the position of the membrane. This is achieved by calibrating the device once before mounting the membrane chamber onto the device and using only the software of the SC-device afterwards when the membran chamber has to be moved along the axis parallel to the stretch/compression. Our uni-directional stretch device produces a homogeneous strain field regardless of the distance to the holders where the membrane is clamped. Thus the displacement of any point is defined by a simple linear correlation that depends on the distance between the observed point from the center of the membrane. A point at the very center of the membrane is not moved out of the optical axis whereas the displacement becomes larger with increasing distance from the center. Using a simple algorithm it is possible to predict this displacement and to counteract it. The system is designed in a way that both motors – the SC-motor and the compensation motor – are operated simultaneously so that there is virtually no delay between cell stretch/compression and compensation. B: With the motion compensation activated, the region of interest remains in the field of view of the microscope. C: Measuring the relative displacement of 5 points on the membrane (all at a distance from the center between 2mm-4mm) we can show that even a stretch of 50% leads to only minor displacement with motion compensation. The mean relative displacements and the standard errors are shown. Figure 3. Image acquisition of ATII cells subject to one fast single stretch with motion compensation applied. 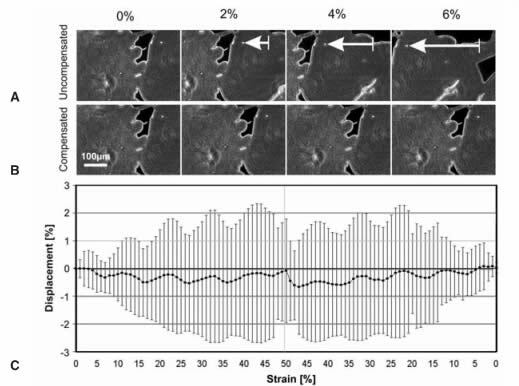 A: Cells were stretched with a simple protocol (20% stretch within 1s) and continuously imaged for 53.6s. The blue part of the time line illustrate the time where images were not in focus. B: Four images of the sequence (numbers are shown in A) show ratiometric images of the Ca 2+ dye Fura-2. The false color images (from low to high Ca 2+ concentrations: blue-red-yellow-white) were calculated from 2 consecutive images acquired with different excitation wavelengths. Images were acquired with a 40x oil immersion objective. The position of the region was ca. 1mm off the center of the membrane parallel as well as perpendicular to the stretch axis. The vertical shift of the image between panels 1 and 2 is caused by the displacement perpendicular to the stretch axis. C: The Ca 2+ signal was quantified and the time course is shown. It demonstrates that the four cells indicated show a slightly different Ca 2+response. Cultivated cells respond to a mechanical stimulus in various different ways and visualization of these responses has become an important tool to investigate mechanotransduction. Microscopic techniques, especially fluorescence detection methods, are steadily improving and countless fluorescence dyes and labeling methods are available to address cell-biological questions related to mechanical stimulation of cell. Examples are Ca 2+-sensitive dyes for measuring Ca 2+ dynamics in alveolar cells of the lung in the course of the respiratory cycle and dyes that address topics like lipid trafficking, membrane stress failure and repair mechanisms. Besides fluorescence dyes also the broad spectrum of fluorescent proteins can be used for life cell imaging in mechanobiology. Techniques such as fluorescence resonance energy transfer (FRET), fluorescence recovery after photo bleaching (FRAP) and other methods can be used to address questions even on a molecular level. Unfortunately, it is difficult to combine fluorescence life cell imaging with mechanical stimulation of cells, especially when cells are deformed by globally deforming an elastic growth substrate, which is a widely used method to stretch cultivated cells. Only the center art of the stretched growth substrate remains in a constant position relative to the objective of the microscope and therefore only cells in this part can be visualized properly when the stretch is maintained or when cellular responses should be detected even during the stretch. For observing other cells the stage of the microscope has to be repositioned to recover the specimen after deformation. For many reasons this task is often impossible and even if the microscopist succeeds it takes up to several minutes to relocate the area of interest. The SC device was designed to overcome this problem by automatically compensating the stretch-induced lateral displacement. The figure on the right shows the cytokeratin network in keratinocytes that were stretched up to 80% of their initial length. As mentioned above the stretching software is not part of the image acquisition software. The figure below demonstrates the main features of the user interface: Stretch Control (left at top) to adjust the distance of the sliding blocks, Motion Control (left, below Stretch Control) to start/pause and stop the stretch protocol, Compensation (left, below Motion control) to activate the compensation, Profile Editor (right, upper window) and Segment Properties (right, lower window) to define the stretch protocol. There are several basic elements to create a stretch protocol: Sinusoidal change, linear change, sigmoidal change and pause. All elements can be combined with each other and the specific properties of each element can be modified with the segment properties function. A. 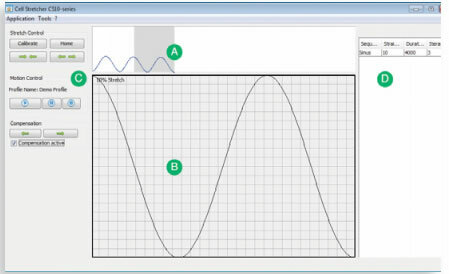 Shows an example for a stretch profile. B. A magnified view of any desired region in the profile (grey overlay in A) can be displayed. C. The user-friendly surface allows to calibrate the device and also to operate it manually. D. In a seperate window the sequence of the single steps as well as the parameters for each individual single step can be programmed. The membrane chamber and the prestrain holder also provide a convenient and save way to handle and cultivate the cells. The holder with the mounted chamber fit in a regular 150mm cell culture dish allowing sterile handling and incubation of the cell in a conventional CO2 incubator. Moreover the cells in the dish can be observed with simple cell culture microscope at low magnification for brief nspection without removing the holder from the dish.